x Rays were discovered just over 100 years ago. Since then diagnostic imaging has evolved and advanced in such a way that it has become an indispensable component of patient diagnosis, management and, in certain cases, treatment. In the field of paediatric radiology, special problems are encountered in imaging children because of their small size, their frequent inability to lie still, and the need to avoid exposure to ionising radiation wherever possible. During the last five years techniques have developed which address these important issues while providing clinicians with higher quality images, and which it is hoped will ultimately lead to better patient care. The following paper includes some of the recent advances in paediatric imaging. The concept of a filmless radiology department as part of a picture archiving and communication system (PACS) is now possible with the advent of digital or computed radiography, and the first filmless children’s hospital is now operational at the New Children’s Hospital, Sydney, Australia. Computed radiography involves radiographs being taken using reusable photostimulable phosphor plates instead of conventional film. These plates become digitised and the corresponding radiographic image can be instantly and simultaneously accessible from television monitors situated anywhere in the hospital. From the radiologist’s viewpoint computed radiography has several advantages. As images are stored on optical disk, there should be no possibility of a film being lost. Digital radiographs can have improved image quality and contain more diagnostic information compared with conventional films because the window width and level can be altered to highlight different tissues, such as soft tissues or bones, in the same way as a conventional computed tomogram image. Edge enhancement is also possible and is a useful technique for optimally visualising catheter tips; this is an important part of radiograph reporting on the special care and intensive therapy units. Images can also be magnified, a feature with which one can increase the ease of tube detection on premature neonatal chest radiographs.1 Image manipulation also increases standardisation between sequential radiographs by minimising the apparent differences in radiographic exposures. This has important implications in the assessment of serial chest radiographs, for example in the comparison of hyaline membrane disease severity in the premature neonate. It can also reduce the number of repeat radiographs performed for over or underexposure.2 One of the major disadvantages of computed radiography as part of a PACS is overcoming the radiologists’ reluctance to report from a television monitor screen. Hard copy images may be produced on a laser imager if required, but studies have shown that converting images onto hard copy for reporting has no diagnostic advantage over analysis of radiographs on a high resolution (2.5K × 2K) television monitor,1although 1K × 1K monitors are more prevalent in Europe and seem to offer adequate resolution. Indeed, a study by Razavi et alshowed that reporting soft copy images can be more accurate than reporting from a laser imaged hard copy.3 In this study, 239 radiographs were analysed for pneumothoraces, linear atelectasis, air bronchograms, and interstitial disease. The results showed that there was no difference in detection rates for pneumothoraces or air bronchograms, but interstitial disease and linear atelectasis were seen more often on soft copy images. From a financial viewpoint installing and running a computed radiography system is expensive. However, multiple financial savings can be made, including no longer requiring film, nor film packets, and a reduced need for film storage. Complex studies into cost saving analyses of implementing such a system over a one year period have not shown a net saving over a conventional department,4 but assessing the benefits obtained on a purely financial basis is difficult. Hospitals with digital fluoroscopy units are more common than those with computed radiography, perhaps due to the cost of installing these units being less. Digital fluoroscopy units have a digitiser attached to the television camera in the image intensifier which permits frame grabbing or last image hold facility. Images are instantly digitised and can be immediately viewed on the television monitor. In the past, images could only be reviewed once a film had been developed, which increased the time taken to perform a procedure. Hard copies of the digital images can be laser imaged following the study and stored in the patient’s packet in the usual way or can be stored as part of a PACS. Perceived benefits include reduced radiation dose to the patient, improved and more stable image quality, improved patient throughput, and a reduction in cost of a procedure.5 Conventional fluoroscopy rooms have now been widely replaced by digital suites, particularly in paediatric centres because of the advantages of dose reduction. The management of intractable constipation and faecal soiling can be challenging. In 1990, Malone et al described how antegrade enemas could be performed in children after the fashioning of an appendicostomy.6 Antegrade enemas lead to more complete colonic emptying and subsequently a more reliable period of faecal continence. Appendicostomy formation, however, requires a general anaesthetic and is, unfortunately, not without complications. Griffiths and Malone, in a study of 21 patients, identified a complication rate of 81%, ranging from wound infections to stoma breakdown requiring laparotomy.7 In 1996, Shandling et alpublished the results of their experience in performing percutaneous caecostomies, for the antegrade administration of colonic enemas, in children with severe constipation or soiling.8 This technique involves fluoroscopically guiding a catheter through the anterior abdominal wall into the caecum. The procedure is performed under local anaesthesia and sedation. In their experience of 15 patients, all were successful and all resulted in faecal continence at least as good as that experienced before the procedure. There were no significant complications and this technique may become commonplace in the treatment of severe constipation. Balloon dilatation of the pelviureteric junction (PUJ) in patients with PUJ obstruction is another new interventional radiological procedure currently being evaluated. It is still in the early stages of development and success rates to date have been poor, but it has potential for being an alternative technique to surgical pyeloplasty. Wilkinson and Azmy have described their experiences in 10 cases.9 The procedure involves passing a balloon catheter into the PUJ either retrogradely at cystoscopy, or antegradely after nephrostomy. The balloon is then positioned at the level of the PUJ obstruction and inflated. Of the 10 cases described, four were successful, three led to no radiological change, and three were unsuccessful and required subsequent surgery. The majority of successful cases were in patients who had not had previous surgical repair of the PUJ. One case was successful in a patient who had previously undergone pyeloplasty and calyceoureteric anastomosis. Improved success rates in this latter group would have particular importance in patient management because of the poor success rates of repeated surgical repair. Expandable metallic angioplasty stents have been used successfully in the treatment of major airway obstruction in children.10These are deployed by a balloon inflation catheter via a bronchoscope under fluoroscopic control and have been used in conditions such as tracheal stenosis and tracheomalacia or bronchomalacia. Filler et al described how seven children were treated in this way.11 The majority were successful, but in one case excessive granulation tissue at the site caused subsequent airway obstruction and necessitated stent removal. In a subsequent case, this complication was prevented by balloon dilatation of the stent in situ. All the children in the study had relief from respiratory obstruction immediately after the procedure.11 Stents cannot be repositioned once deployed, but more than one stent can be placed if the original stent position is not ideal. It is too early to determine the natural history of airway stents in children since no stent has been in a child for more than two years, but mucociliary function does not seem to be impaired since epithilialisation of the mesh has been seen to take place. This technique is likely to provide a safe and effective alternative to aggressive medical or complicated surgical treatment options. Transjugular intrahepatic portosystemic shunt procedures are now used in the palliation of adults with portal hypertension.12This technique provides a means of reducing the portal system pressure by creating an intrahepatic connection between the hepatic and portal veins by an internal jugular vein approach.12 This has been described successfully in children with bleeding oesophageal and gastric varices.13 As well as controlling the bleeding, there was an improvement in liver function and a reduction in the amount of ascites after the procedure. As well as being indicated for intractable varicose bleeding, this technique would appear to be a useful way for preparing patients with end stage liver failure safely for elective rather than emergency liver transplantation. Conventional colour Doppler ultrasound (CDU) is an accurate and useful tool used in diagnostic imaging to determine direction and velocity of blood flow within organs and vessels. On CDU images, flow towards the transducer is conventionally assigned a red colour and flow away, blue (fig 1A). The velocity of the flow correlates with a spectrum of colour with bright red/blue representing high velocity. In 1994 Rubin et al described a technique whereby the Doppler signal could encode power rather than velocity and direction.14 In this way, the actual number of flowing corpuscles could be represented as colour, rather than the velocity and direction at which they were moving (fig 1B). This technique, called power Doppler or colour Doppler energy, is three to five times more sensitive to flow than CDU and is ideally suited to small, low flow vessels. Power Doppler can be achieved on a conventional colour Doppler ultrasound machine with only a software application upgrade. (A) Colour Doppler ultrasound image of a kidney showing the interlobar vessels. (B) Power Doppler ultrasound image of the same patient showing smaller and more peripheral vessels. Power Doppler has potential use in conditions where absent, reduced, or increased blood flow is present. It also gives exquisite images of the vessel wall. Because of this it can be used to image thromboses, stenoses, and vessel patency more effectively than CDU.15This is especially useful in detecting thrombosis associated with intravascular catheters and in the assessment of hepatic artery stenosis or thrombosis leading to parenchymal ischaemia after liver transplantation. The small vessels supplying the non-ossified femoral head in infants can also be demonstrated. Excessive hip abduction for the treatment of developmental dysplasia of the hip in a spica may occlude these vessels, possibly resulting in avascular necrosis. Bearcroft et al showed that during hip abduction the patency of these vessels can be assessed with power Doppler.16 Further research may confirm that power Doppler could be used to reduce the risk of this occurring by determining the degree of abduction possible without the vascular supply of the femoral head being compromised. Lymphadenitis, appendicitis, cholecystitis, and inflammatory bowel disease are conditions in which power Doppler may play an important diagnostic part by detecting an increase in blood flow. Distinguishing the highly vascular lymphadenopathy in lymphadenitis from a reactive lymph node is likely to be possible with power Doppler.15In the same way power Doppler may provide a useful method of diagnosing and monitoring the hyperaemia of osteomyelitis. More attention has been paid in the literature to the application of power Doppler in conditions with reduced vascularity, most notably testicular torsion and pyelonephritis. The prepubertal acute testis is notoriously difficult to assess radiologically as well as clinically. The organ may have a volume of less than 1 ml and contain correspondingly small vessels. Flow cannot be detected in the majority of normal prepubertal testes measuring less than 1 ml using CDU.17 Although absent flow in complete testicular torsion is the norm on CDU, early or partial torsion may show normal or only a slight reduction in flow. Power Doppler has been used in these conditions to assess whether or not it is superior to CDU. A study comparing power Doppler with CDU in assessing normal prepubertal testis showed that blood flow was detected more often with power Doppler.18 In a study by Coleyet al power Doppler, CDU, and nuclear scintigraphy were compared in an animal model with testicular torsion.19Power Doppler was found to be superior to both CDU and scintigraphy in detecting abnormalities in testicular flow. Power Doppler ultrasound would seem to have future potential in the diagnosis of testicular torsion, but its definitive role has yet to be fully determined. Power Doppler is unlikely, however, to replace CDU. It is highly prone to movement artefact, which is all too common in the typical paediatric patient, and so will probably only have a minor overall role vis-a-vis ultrasonography in children. It is more likely to occasionally augment CDU as a diagnostic tool. It has been stated, somewhat flippantly, that one significant role of power Doppler is that it helps make spectacular slides! Positron emission tomography (PET), using the tracer 18 F fluorodeoxyglucose, allows functional in vivo imaging by detecting levels of glucose metabolism. In children, this has been used primarily in neuroradiology. Potential uses in cerebral palsy25 and neonatal hypoxicischaemic events26 have been described, but its main use to date has been in the assessment of patients with epilepsy where computed tomography or magnetic resonance imaging is normal.27 Areas of hypometabolism in the interictal state have been shown to correlate well with an epileptogenic focus.27 In this way, preoperative neurosurgical planning can be performed non-invasively. Inflammatory bowel disease is relatively uncommon in children and its diagnosis is often difficult. Barium studies can involve unpleasant bowel preparation and expose the child to irradiation. Endoscopy does not involve radiation exposure, but sedation/anaesthesia and bowel preparation for colonoscopy are often required. Upper gastrointestinal endoscopy is also operator dependent with access to the small bowel being limited. Neither technique can image the whole gastrointestinal tract during one examination. Recent studies have established the role of technetium-99m hexamethylpropyleneamineoxime (99mTc HMPAO) labelled autologous white cell scans in children with suspected inflammatory bowel disease. In a comparison between different methods of investigating these patients, 99mTc HMPAO labelled white cell scans were found to have a higher sensitivity than barium studies or colonoscopy with biopsy,28 and also to more accurately define disease location and intensity.29 HMPAO white cell studies cannot detect fine anatomical detail such as strictures or fistulae, but they do involve a smaller radiation dose than barium studies30 and can image the whole gastrointestinal tract at a single sitting, an important feature in the acutely ill child. These nuclear medicine examinations can therefore be used as a non-invasive means of monitoring response to treatment28or as an initial diagnostic tool to localise bowel involvement (fig 2) in order that a subsequent endoscopic biopsy can be arranged.30 Barium studies in the future will possibly play a more limited part in the assessment of inflammatory bowel disease, being primarily used in preoperative surgical planning. 99m Tc HMPAO scintigram of a child with Crohn’s disease showing avid uptake of the radiopharmaceutical in the diseased terminal ileum, caecum, and ascending colon. Normal uptake is seen in the spleen. Despite several well known advantages of magnetic resonance imaging over computed tomography, the latter is by no means becoming obsolete in the paediatric radiology department. Recent advances in slip ring technology, table feed mechanisms, and x ray tube heat loading capacities have led to the development of spiral or helical computed tomography. These new generation scanners have been available since the early 1990s and are revolutionising computed tomography practice, with several major advantages in paediatric imaging. One of the most useful advantages of spiral computed tomography is speed. The ability to perform a computed tomogram in a much shorter time than was previously possible greatly reduces the risk of movement artefact degrading the images. A greater throughput of patients in the computed tomography suite and potentially less patient radiation dose because of there being no need to repeat scans are additional advantages. In a study comparing conventional with spiral computed tomography in children unable to breath-hold, Cox et alshowed that spiral images contained no more motion artefact than conventional computed tomography and that they took half the time.32 Spiral images could also be manipulated to improve image sharpness and anatomical resolution. There is much controversy in the literature about the safety and necessity of sedation in paediatric imaging. Sedation is not without risk. Respiratory depression, aspiration, and allergy are all recognised complications. Spiral computed tomography reduces the need for sedation. White compared the sedation rate over a six month period in children having both conventional and spiral computed tomography.33 Spiral computed tomography led to a reduction in the rate of sedation by 45%. A reduction in sedation rate is not only safer for the patient, but reduces costs, saves time, and increases efficiency. The speed of scanning also improves image quality and the minimisation of motion artefact increases image resolution. 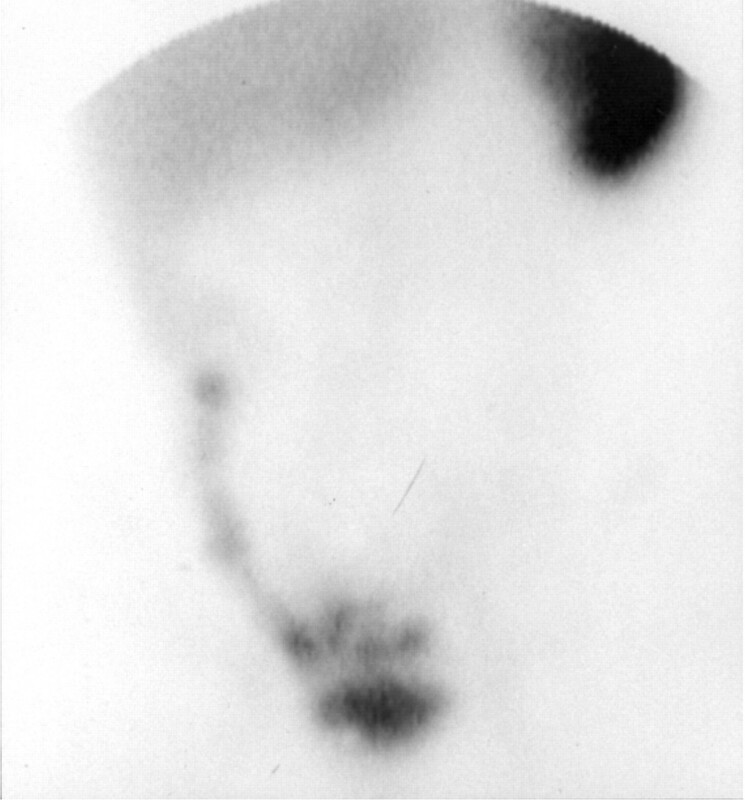 For example, in 85% of patients the superior and inferior lingular bronchi can be identified.34 These structures are often not visible on a conventional chest computed tomogram. Not only is motion artefact minimised but so are the problems caused by breathing. In conventional computed tomography the cooperative patient takes a breath for each section obtained. True contiguous slices are dependent on the patient taking exactly the same depth of breath on each occasion. This is obviously not always the case and lesions, such as small pulmonary nodules, can be missed. In spiral computed tomography this cannot occur. The single volume acquisition technique allows the whole lung to be imaged in complete continuity. Remy-Jardin et al showed that spiral computed tomography in adults detected more pulmonary nodules than conventional computed tomography, and that these nodules were smaller.35 Although no similar study has yet been performed, it is likely that these findings can also be applied to children. One of the most aesthetically pleasing advances from spiral computed tomography is the ability to generate impressive two or three dimensional images. Two dimensional images in the sagittal, parasagittal, coronal, or even in a curved plane are possible. This allows clearer visualisation of complex anatomical structures, such as the porta hepatis and common bile duct, which lie in an oblique plane.37 Three dimensional images using either maximum intensity projection or shaded surface display are proving extremely useful in paediatric imaging. In lung transplant recipients, bronchial dehiscence, stenosis, and the assessment of bronchial stent position are easily visualised with maximum intensity projection images.38 Three dimensional images are ideally suited to the demonstration of complex fractures or congenital abnormalities, particularly in the skull and cervical spine.39 Three dimensional reconstruction is also of proved benefit in the assessment of solid paediatric tumours. Plumley et al describes how nine solid tumours were successfully treated surgically after spiral computed tomography with three dimensional reconstruction.40 Assessment with conventional computed tomography had been equivocal with regard to suitability for surgical resection. Spiral computed tomography provided further anatomical information which aided in a successful surgical outcome in all nine cases.40 It is likely that the more accurate assessment of tumour volume with spiral computed tomography would also be helpful in oncological follow up and management. Magnetic resonance imaging has revolutionised paediatric radiology practice. In the last five years the development of magnetic resonance angiography (MRA) and venography (MRV) has increased further its application and indications. Although primarily used in neuroradiology, MRA is being used more frequently in body magnetic resonance imaging. Images of blood vessels are obtained using gradient echo, rather than the more standard spin echo pulse sequences, with computer post-processing to create vascular flow images. This does not involve the administration of any intravascular contrast agent. Arteries or veins can be imaged in this way with time of flight (amplitude contrast) or phase contrast images being viewed in two dimensional multislice acquisition or as a three dimensional volume technique (fig3). 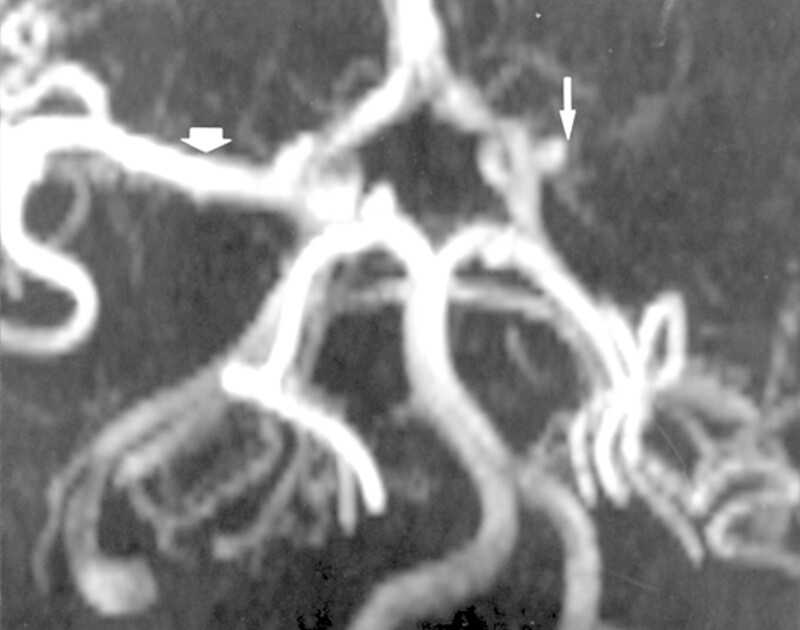 Three dimensional time of flight magnetic resonance angiogram of the circle of Willis in a child showing a normal right (thick arrow) but an absent left (thin arrow) middle cerebral artery. The majority of work concerning MRA has been performed in adults. Its application in children is still being assessed. In a study by Leeet al, 63 paediatric patients with a variety of neurological or neurosurgical conditions were evaluated by MRA.42 In nearly half of these cases correlation was available with conventional angiography. MRA was found to be particularly useful in determining vessel displacement or compression by tumours or as a consequence of congenital disorders such as meningoencephaloceles. Its tumour assessment was most accurate in the skull base or juxtasellar region due to the larger vessels encountered here. However, MRA was not as good as conventional angiography in the assessment of tumour vascularity. In determining the cause of cerebral ischaemia and stroke in paediatric patients, Wiznitzer and Masaryk have had some success at distinguishing large from small vessel disease.43 Dural arteriovenous fistulas which are not seen on magnetic resonance imaging can be demonstrated and diagnosed on MRA, although the vessels are more clearly seen on conventional angiography.42 Conventional angiography is not without risk, however, and in children this risk is increased by the almost invariable need for general anaesthesia. MRA, although often requiring sedation, can avoid the need for general anaesthesia. MRA has its limitations, however. It has not been found to be useful in accurately assessing arteriovenous malformations because the vessels are often too numerous and small. It has also been disappointing in arteritis, where conventional angiography is superior due to its increased spatial resolution.42 In adults, MRA is only accurate in detecting aneurysms above 3–4 mm in size.44In children this is also likely to be the case. MRA has also been used in paediatric body magnetic resonance imaging. Ferrer et al used MRA in four preoperative paediatric patients with complex renal masses.45 The results were compared with ultrasound, computed tomography, and operative findings. In each case the MRA gave comparable images to conventional angiography and provided more angiographic information than ultrasound or computed tomography. It had a 100% correlation rate with the operative findings.45 Accurate evaluation of the vascular anatomy before a partial nephrectomy or before undertaking the removal of a large complex renal mass can be immensely helpful for the surgeon. MRA can provide this without a general anaesthetic, without a contrast load, and at less than half the cost of conventional angiography. MRV is now the investigation of choice after the first year of life for the diagnosis of dural venous thrombosis. It is superior to conventional venography because images are flow sensitive, and not prone to the well known artefactual pitfall of poor opacification on the side contralateral to the internal carotid artery injection. As well as the large venous sinuses, MRV can detect thrombus within small cortical veins.42 It has also been shown to be useful in determining venous involvement or displacement by mass lesions. Like MRA, however, it provides no increased information in the assessment of arteriovenous malformations. Faster and varied magnetic resonance imaging pulse sequences with differing advantages are continuously being developed. Magnetisation transfer is one such new magnetic resonance imaging technique which has the potential to create contrast difference between normal and pathologic tissues distinct from T1 and T2 weighted contrast.46 Magnetisation transfer has been found to cause suppression of signal in normal muscle, cartilage, brain, and liver with minimal or no suppression of signal in fluid, blood or fat. Magnetisation transfer sequences will probably have an increasing role in paediatric brain and musculoskeletal imaging in particular, since the acquisition times of these sequences are significantly faster than conventional inversion recovery techniques. We wish to thank Dr M Pike, consultant paediatric neurologist, for providing the magnetic resonance angiogram. (1996) Computed radiography in neonatal and pediatric intensive care units: a comparison of 2.5K × 2K soft-copy images vs digital hard-copy film. Pediatr Radiol 26:333–336. (1991) Digital imaging with photostimulable phosphor in the chest of newborns. Radiology 181:829–832. (1991) Receiver-operating-characteristic study of chest radiographs in children: digital hard-copy film vs 2K × 2K soft-copy images. AJR 58:443–448. (1995) Soft-copy computed radiography in neonatal and pediatric intensive care units: cost-savings analysis. Radiology 197:501–505. (1992) Digital imaging in pediatric hospitals. J Digit Imaging 5:79–81. (1990) Preliminary report: the antegrade colonic enema. Lancet 336:1217–1218. (1995) The Malone antegrade continence enema. J Pediatr Surg 30:68–71. (1996) Balloon dilatation of the pelviureteric junction in children: early experience and pitfalls. Pediatr Radiol 26:882–886. (1996) Wire stent for tracheomalacia in a five-year-old girl. Ann Thorac Surg 61:1239–1240. (1995) The use of expandable metallic airway stents for tracheobroncial obstruction in children. J Pediatr Surg 30:1050–1055. (1992) Transjugular intrahepatic portosystemic stent shunt (TIPSS): early clinical experience. Clin Radiol 46:166–169. (1994) Percutaneous transjugular intrahepatic stent shunt for treatment of intractable varicose bleeding in paediatric patients. Eur J Pediatr 153:721–725. (1994) Power Doppler US: a potentially useful alternative to mean frequency-based color Doppler US. Radiology 190:853–856. (1996) Power Doppler sonography: basic principles and clinical applications in children. Pediatr Radiol 26:109–115. (1996) Vascularity of the neonatal femoral head: In vivo demonstration with power Doppler US. Radiology 200:209–211. 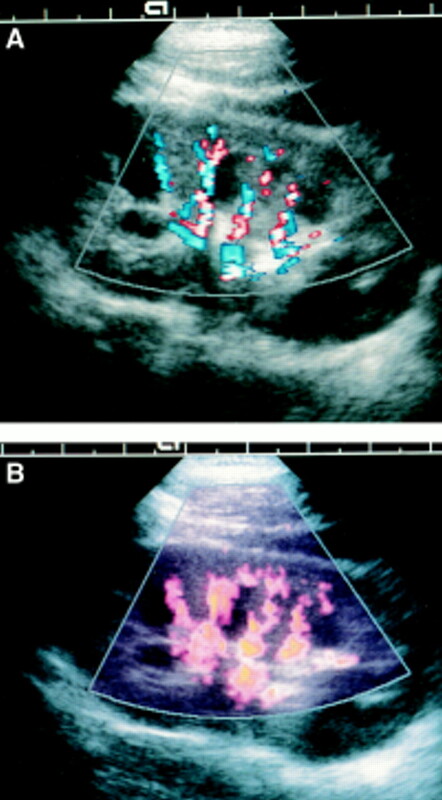 (1994) Color Doppler sonography of the normal pediatric testis. Clin Radiol 49:266–267. (1996) Scrotal US in pediatric patients: comparison of power and standard color Doppler US. Radiology 198:381–385. (1996) Acute testicular torsion: comparison of unenhanced and contrast-enhanced power Doppler US, color Doppler US and radionuclide imaging. Radiology 199:441–446. (1996) Regional cerebral blood flow estimates in newborn lambs using amplitude-mode color Doppler ultasound. Pediatr Radiol 26:282–286. (1996) Contrast agents in ultrasound. Br J Hosp Med 55:1–2. (1996) Microbubble color Doppler angiography of breast masses—work in progress with Levovist. Radiology 198:679–686. (1997) Possibility of differentiating small hyperechoid liver tumours using contrast enhanced colour Doppler ultrasonography: a preliminary study. Clin Radiol 52:41–45. (1994) Contrast sonography for detection of vesicoureteral reflux. Lancet 344:687. (1991) Regional cerebral glucose metabolism in clinical subtypes of cerebral palsy. Pediatr Neurol 7:415–425. (1993) Repeated fluorodeoxyglucose positron emission tomography of the brain in infants with suspected hypoxic-ischaemic brain injury. Eur J Nucl Med 20:759–765. (1994) The role of PET in childhood epilepsy. J Child Neurol 9 (suppl 1) S82–S88. (1996) Investigating inflammatory bowel disease-white cell scanning, radiology and computed tomography. Arch Dis Child 74:22–26. (1994) Technetium-99m-hexamethylpropyleneamine-oxime-labeled leukocyte scintigraphy in inflammatory bowel disease in children. J Pediatr 125:213–217. (1996) Technetium-99m-HMPAO labelled leucocytes in the detection and monitoring of inflammatory bowel disease in children. Br J Radiol 69:508–514. (1996) Helical/spiral CT scanning: a pediatric radiology perspective. Pediatr Radiol 26:5–14. (1995) Comparison of helical and conventional chest CT in the uncooperative pediatric patient. Pediatr Radiol 25:347–349. (1995) Reduced need for sedation in patients undergoing helical CT of the chest and abdomen. Pediatr Radiol 25:344–346. (1995) Pediatric applications of helical (spiral) CT. Radiol Clin North Am 33:997–1022. (1993) Pulmonary nodules: detection with thick-section spiral CT versus conventional CT. Radiology 187:513–520. (1993) Detection of focal hepatic lesions with spiral CT: comparison of 4- and 8-mm interscan spacing. AJR 160:783–785. (1994) Helical CT: abdominal applications. Radiographics 14:919–924. (1994) CT of complications in pediatric lung transplantation. Radiographics 14:1341–1349. (1994) Pediatric craniospinal spiral CT: current applications and future potential. Semin Ultrasound CT MR 15:148–155. (1995) The role of spiral (helical) computerized tomography with three-dimensional reconstruction in pediatric solid tumors. J Pediatr Surg 30:317–322. (1994) Helical CT: clinical performance and image strategies. Radiographics 14:894–904. (1995) MR angiography in pediatric neurological disorder. Pediatr Radiol 25:409–419. (1989) Cerebrovascular abnormalities in pediatric stroke: diagnosis using magnetic resonance angiography. Ann Neurol 26:440–441. (1990) Intracranial aneurysms: evaluation by MR angiography. AJR 11:449–456. (1994) Noninvasive angiography in preoperative evaluation of complicated pediatric renal masses using phase contrast magnetic resonance angiography. Pediatric Urology 44:254–259. (1996) Applications of magnetization transfer contrast in the musculoskeletal system in children. Pediatr Radiol 26:894–899.